Before CGI Backgrounds, Film Makers Used A Technique Known As? The Largest Ant Colony In The World Is Comprised Of Which Ant Species? Long before computer rendered graphics would create sweeping backdrops in everything from Sci-Fi movies to summer blockbuster action flicks, film makers were already inserting fake backgrounds into their films in a distinctly more analog way. The technique was known as “matte painting” and was created primarily by the placement of detailed background paintings on large sheets of glass. The sheets were inserted into the physical space where the live action film was shot and, when viewed on film, appeared to be a seamless component of the scene. Why glass instead of sheet board or canvas? Placing the paintings on glass allowed the artists to fill in only the necessary elements while leaving the required components of the scene visible. The powerful scene in 1968’s Planet of the Apes which shows the Statue of Liberty crumbled, corroded, and sticking up out of the shoreline of a long forgotten New York was created using matte painting. The artists painted the statue to perfectly fit with the scene of the shoreline such that the sheet of glass could be held up in front of the camera during filming and, when viewed as a finished product, the painted statue looked like a distant, real, and properly sized statue. Although almost entirely replaced by computer rendering now, matte painting was used extensively in 20th century film making and you’ve most certainly seen a film or two (and more likely dozens of them) with matte paintings. 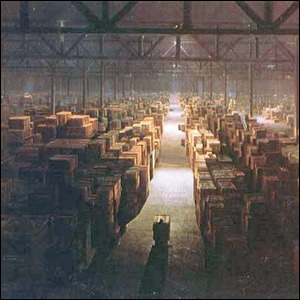 Matte paintings were used, for example, to create the crystal fields in The Never Ending Story, the massive Roman cities in Ben Hur, the fleets of ships in Treasure Island, the Fortress of Solitude in Superman, numerous scenes in Gone with the Wind (including the scorched battlefields), and, pictured here, the massive warehouse at the end of Indiana Jones: Raiders of The Lost Ark.